Last week we shared our top picks for development conferences in Europe. And guys, we weren’t kidding, when we said that we love them. Because this week, we’re looking through marketing events that you should keep your eye on for early bird tickets. You’re an experienced guru? Or just started tapping into digital marketing world? There’ll be something for everyone’s taste and level of experience, we’re sure about that. So, without further ado, here’s our a bit lengthy list of recommendations. As one of the biggest affiliate conferences in Europe, this one gathers field experts from around the world. This conference organizers always pay a lot of attention to what their visitors want to hear, so expect hand-picked topics and engaging sessions that are tailored to your needs specifically. It’s also a great chance to network, since the conference provides many opportunities to do that. Promising an event that ‘Prague has never witnessed’, Marketing Festival offers a strong lineup and many engaging activities with the lecturers. From data, tech and behavioral economics specialists to digital marketing experts of all kinds, this truly seems like an event worth visiting. 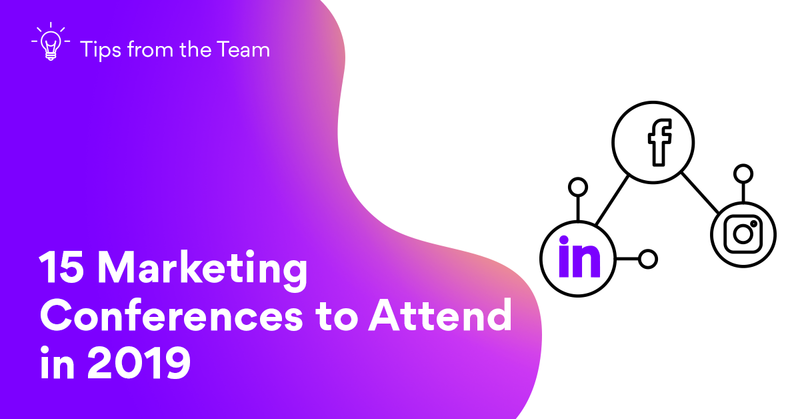 Besides many talks by digital marketing pros, you also get a chance to party with like-minded gurus and build long-lasting connections. This expo primarily focuses on the newest marketing technology, just like the name suggests. If you want to learn about the tools and services changing the marketing world, this is the place to be. This two-day event also offers many seminars with the most influential figures in marketing. It’s a perfect opportunity to get an insight into the future of tech in digital marketing! This one of the biggest, twice a year happening search marketing conference, is filled with in-depth talks, trainings and networking. It’s a perfect place to deepen your knowledge in everything SEO related, and with the field experts that they have already lined-up, it looks like you’ll definitely learn something new and useful! If you’re tired of the same names in the lineup and want to discover hidden gems in the industry, then OMR Festival is definitely for you. This conference mixes important and big players in the industry, with less known ones that you should keep your eye on. Speakers here always have profound insights to share and makes you look at marketing from a different perspective. What are the most innovative products? What new, cutting-edge solutions are there? How can you join the digital transformation? All these questions are answered at Digital Enterprise Show. This conference is aimed at CEOs, CIOs, CMOs and HR departments who develop and execute the company vision. So expects different kinds of topics – from big data to drones – there’s something for everyone there! The biggest, boldest and craziest marketers gather here – there’s no doubt about that. Savage Marketing discusses customer journey, talks about data-driven strategies, storytelling, creating engaging content and mobile advertising. It’s a perfect opportunity to learn and connect with the best in the industry and get inspiration for your next marketing strategy. More than 400 speakers, over 60 events, 45 training rooms – this is what Web Marketing Festival offers every attendee. With a rich programme, this conference gathers digital marketing professionals and global visionaries from around the world. From startup competitions to music shows and awards – there’s something to everyone’s taste. Affiliate World gathers some of the best affiliate and e-commerce marketers to exchange ideas, learn from each other and get inspired. KISSmetrics, Unbounce, Shopify – these are just a few companies participating in the conference and sharing their insights and knowledge on the panels. Get the next-level tips, tricks and strategies in Learn Inbound. This conference focuses on topics such as SEO, PPC, CRO, Analytics, PR, Content Marketing and Growth Marketing. This annual, two-day event analyzes various case studies, campaigns and tools to see how you can be more effective and efficient. An event all about Growth Marketing with the world’s leading experts. Sounds good? We agree! During this Summit, you’ll learn more about effective optimization. It’s a one-day event, because as the organizers say themselves, ‘100% knowledge – 0% blah blah’. SUPERWEEK invites the constantly growing measurement industry professionals, analysts and leaders to deep dive into everything data-related. During this extensive, five-day experience, you’ll not only enjoy the beautiful mountains but also will learn new ways to analyze data and to make better data-driven decisions. From intermediate to advanced – UnGagged invites different level marketers to talk about SEO, Content Marketing, Links, Social, Reputation Management, CRO and much more. This knowledge packed conference ends with an intensive masterclass. It looks into new, inventive marketing strategies and also touches on subjects like GDPR affecting today’s marketing. We’ve all seen how great customer service can skyrocket a business’ success and this summit looks more into it. During this event, you’ll discuss Customer Experience, New technologies, Talent, Development and Training, Social Customer Care, Self-Service and more. It’s great place to learn how your customer support team can become your greatest brand ambassadors. This huge forum exploring the future of digital marketing technologies attracts speakers from top companies in the world. If you want to listen to the Head of Gamification from Gucci or see what Global Senior Online Marketing Manager at Siemens has to say, look no further. Topics here range from content marketing to discussing disruptive tech. It’s really an event worth checking out!